Published: Dec. 31, 2013 at 10:37 p.m. Updated: Jan. 2, 2014 at 12:49 p.m. The Houston Texans were the first team to make a head coaching change this season, firing Gary Kubiak on Dec. 6. With less than two hours left until the ball dropped in Times Square, the Texans found a new coach. NFL Media Insider Ian Rapoport reported Tuesday night that the Texans reached an agreement with Bill O'Brien for him to become their next head coach, according to a source informed of the negotiations. O'Brien, a former New England Patriots offensive coordinator, leaves Penn State just two seasons after taking over the program. O'Brien flew into Houston on Wednesday, and Penn State sent out a release Thursday announcing O'Brien's move to the Texans. O'Brien's profile is not so different than Kubiak's was when the Texans hired him in 2006. Like Kubiak, O'Brien is a young offensive mind that learned at the feet of a coach with multiple Super Bowl championships. 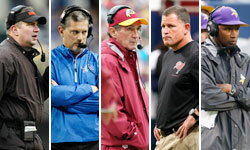 The move caps a whirlwind career climb for the 44-year-old O'Brien, who was Duke's offensive coordinator/quarterbacks coach as recently as 2006. He worked his way up through offensive jobs in New England, taking over as coordinator in 2011. He went 15-9 in two seasons at Penn State, easily topping expectations in 2012 after the program was decimated following the Jerry Sandusky scandal and NCAA sanctions. However, it's since become apparent that O'Brien was not at Penn State for the long haul. Two Januarys ago, O'Brien's then-agent Joe Linta told Rapoport: "Everybody's dream, like (O'Brien's), is to be an NFL coach." In New England, O'Brien's offense relied on two-tight end sets, changing game plans dramatically from week to week. Unlike Patriots offensive coordinators Charlie Weis and Josh McDaniels before him, O'Brien found success after leaving the talented arm of Tom Brady. O'Brien will also work with a strong general manager in Rick Smith rather than hold personnel control like McDaniels. It's hard to imagine a more difficult, pressure-packed situation than the one O'Brien inherited at Penn State. He handled it all well, especially the public side of being a coach. That experience should serve him well in Houston, where expectations will be high. The Texans hold the No. 1 overall pick in the 2014 NFL Draft, and it would be a surprise if they don't take a quarterback. Houston is known as a well-run, patient organization under owner Bob McNair. It's a great job and O'Brien was smart to jump at it, no matter how much backlash he gets from the Penn State community. After years of falling short of the Patriots in the AFC, the Texans decided to see if a Bill Belichick protege can turn their franchise around.